For more than a century, UPMC Magee-Women’s Hospital has been caring for women through all stages of their lives. UPMC is one of the nation's top hospitals specializing in women, Magee combines a wealth of specialty services. Long renowned for its services to women, Magee also offers a wide range of care to men as well. 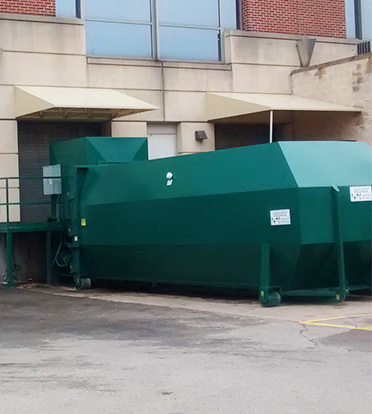 Our team installed one of our custom auger compactors at the Magee-Women's Hospital which is in Pennsylvania. The custom auger we created for UPMC is designed for hospital recycling of cardboard and bulky material compacting. With bin sizes ranging from 15 - 28 feet and a capacity ranging from 4,100 - 7,200 pounds, Sani-Tech System's bins suit any hospital's needs. hospitals run cleaner by helping with odor control, reducing the number of scavengers/insects and eliminating wind-blown debris. can help create a cleaner hospital environment which contributes to an all-around better experience for their patients.